This product has come in the nick of time. Collectors can use a dose of history and heroism and this product can and will provide that. Every box has 2 relics, stamps or autographs and when you see what’s in there you will sold on it the same way I was. For around $68 dollars this is one of those sets that has base and insert cards that will be sought after and if you ask me I would collect the entire set. After thumbing through the cards this first one smacked me in the face. 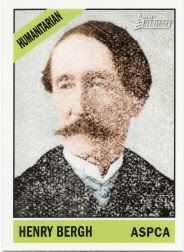 It was a base card of Henry Bergh, the man who founded the ASPCA and ASPCC! Without these two groups children and animals would have continued to be abused in the early 1800’s.